Local officials from Foodlink, United Way and 211 met Tuesday afternoon to speak out against the federal shutdown, and discuss how it’s impacting low-income and food-insecure residents in Rochester. The government has been shut down for over a month now, and with no end in sight, the organizations are asking the community for their help. Julia Tedesco is the president and CEO of Foodlink. "By either donating funds, food, or volunteering their time at Foodlink or with one of our community partners. This is a call to action to help our neighbors feed their families and make ends meet during a period of uncertainty, and in some cases, crisis." 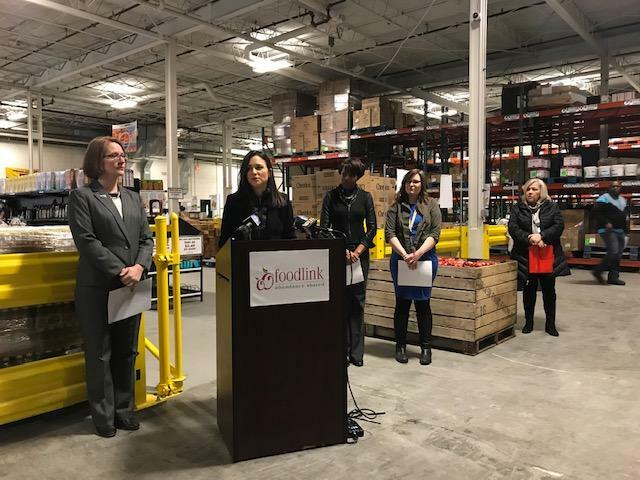 Local officials from Foodlink, United Way and 211 met Tuesday afternoon to speak out against the federal shutdown, and discuss how it’s impacting low income and food insecure residents in Rochester. WXXI's Caitlin Whyte has more from Foodlink's distribution center. She says the most immediate impact of the shutdown has been to federal workers, who are now seeking emergency food after not receiving paychecks, and says that there is “no way that organization, or local nonprofit or government partners alone can solve this issue, or make up for lost SNAP benefits in the shutdown continues." Corinda Crossdale, commissioner of the Monroe County Department of Human Services, reminded those who receive SNAP benefits that the early disbursement of funds that came last week is not extra, and to budget accordingly. "Though recipients will not receive that additional benefit in February, they do not need to spend their full benefits in January. They do not have to spend them all. Your benefits will not go away." Jamie Saunders is the president and CEO of United Way and is encouraging any furloughed workers to call 211 for information. "To make sure people understand the services that are available to them. For some, suddenly without a paycheck, it’s the first time they are reaching out for help. And we will be there to serve them." You can also text 898-211 or go online.